Vintage One: 20 years of Mtn Bike passion and counting. : A new pony in the barn. 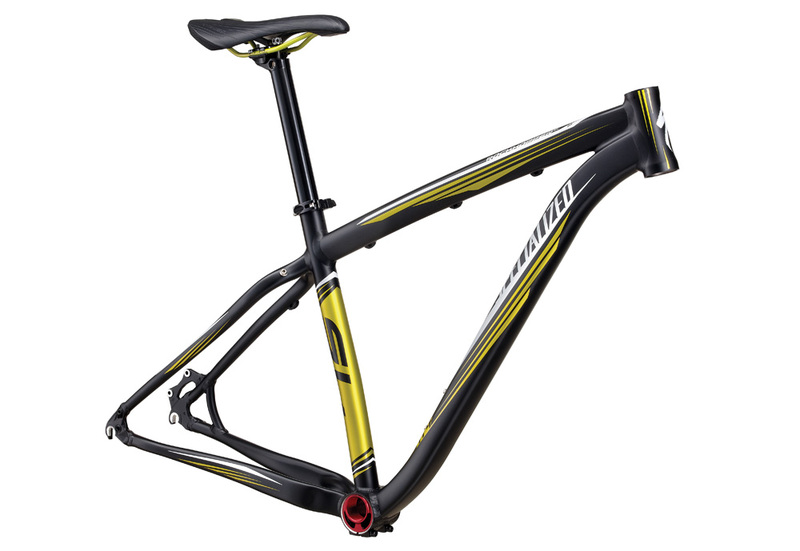 Earlier this year I had the chance to test ride a 2010 Specialized Rockhopper SL SS bike. I found it flawed, but still a fun bike to ride and not at all bad for the price. I also felt that the frame was good enough to offer as a budget minded frameset. That has happened for 2011. Recently there were mutual gauntlets tossed down between the product manager for the Rockhopper line of bikes and I. It was friendly, but he felt that I was a bit, well, harsh about the bike considering the cost of the thing and I felt that I was quite fair and that perhaps the parts compromises made in the name of cost cutting were holding the bike back. I wondered aloud if it would be worth another shot at the 'Hopper SS as a frame-up build with a bit better parts selection, but still keeping to a moderate budget. Deacon, the Specialized manager person, agreed that the idea had merit and so this is on its way, so I have been told. I love the BB set-up on this thing. It was trouble free before, so we shall see what a longer visit brings. A fork is coming from RockShox...not sure what it is, but I suspect it is a new Recon 29er. We shall see...could be a Tora or Reba. There may be some new brakes from the latest line of hydro stoppers...that is pending as well. Other wise I will be moving over parts from the SS Jabberwocky, which for the last year has been faithfully taking me everywhere that I asked it to. The Jabber is a fine bike, but there are some plusses to the 'Hopper...and some minuses too. I know it will be lighter, so that will be good. I am pretty sure I will prefer the handling of the 'Hopper as well, but the past test bike did not quite ride as well as the steel-is-real Jabber. Aluminum, ya' know. Anyway, more details to come when the big brown santa comes to town. It should be a fun build. I may even play with a different crank set-up if I can come to a cheap and clean solution. I am torn between staying old school with a tapered BB Phil Wood style and some version of a matching crank...or...go new school with a external BB (maybe a Chris King) with some kind of older XTR...or...just keep running the XT Octalink II cranks I have now. Meh! We shall see. Suggestions?